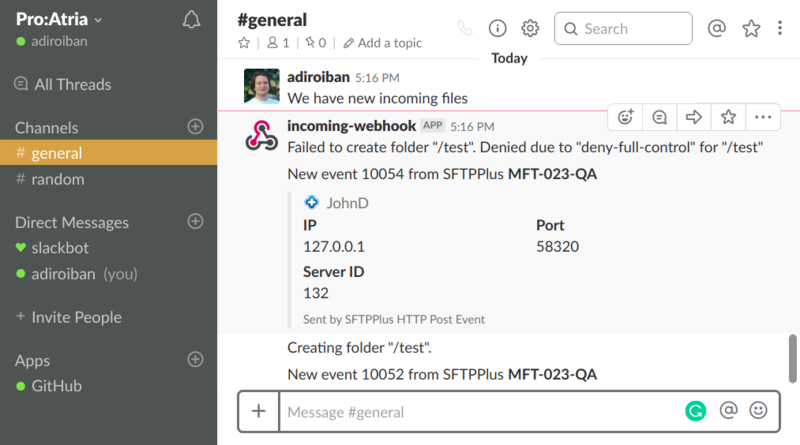 The HTTP POST Event Handler is where you can integrate SFTPPlus with your web resource. Simply create an event handler that will send a HTTP POST request to your remote HTTP resource based on specified server event IDs. Using the previous example, a new Event Handler of type Send as HTTP Post request is created. In addition, the resource URL will emit a custom server code 203 . Event details are transferred using unsecured HTTP connections. Use this method only over private networks. When an HTTP or HTTPS handler is used, SFTPPlus will initiate a POST client request to the configured URL with a body containing one or more events, together with the identity of the server making the request. The request body is formatted as JSON. UUID of the server emitting this event. Each event from the events array contains the following attributes. "details": "Some details about failure." When we cannot get a response from the remote HTTP server (such has network failures or remote resource not found), or the response code is not one of the accepted codes, SFTPPlus will consider that the request has failed. Failed requests are not retried and the server will stop sending events after the configured number of consecutive failures. You can configure the event handler to add custom values to the payload. The extra values are configured in JSON format and can be nested structures. The keys and values can contain variables which are replaced with values based on the event’s data.